Leonard Randolph Wilkens was born in Brooklyn, New York, on October 28, 1937, son of an African American father and white mother. He grew up in the Bedford-Stuyvesant section, one of the toughest sections in the city, where he endured many hardships, including the loss of his father at a young age, poverty, and racism. A sympathetic priest encouraged him to play basketball for Boys High School in Brooklyn. His basketball skills helped him win a scholarship to Providence College, a small Catholic institution in Rhode Island. Wilkens helped the college win a berth in the National Invitational Tournament (NIT) in 1959 and again during his senior year in 1960. Although Providence College did not win the championship in 1960, Wilkens was named Most Valuable Player (MVP) of the Tournament. Soon after he graduated in 1960 Wilkens was chosen by the St. Louis Hawks in the National Basketball Association (NBA) draft. Over the next eight years with the Hawks he firmly established himself as an invaluable team player. Between 1960 and 1970 he was voted to nine all-star teams and in 1968 finished second to Wilt Chamberlain for the NBA’s MVP Award. Wilkens was traded to the Seattle Super Sonics in 1968 and one year later became the player-coach. In his new position he led the Sonics to their first winning season in 1971-72. Wilkens left coaching behind in 1972 to concentrate on playing with the Cleveland Cavaliers for two seasons. He again became player-coach of the Portland Trail Blazers, beginning in 1974. After a 15-year playing career he retired from playing in 1975 and stayed on to coach the Trail Blazers for one more season. He ranks among the all-time leaders in assists, free throws, and was named MVP in the 1971 All-Star game. 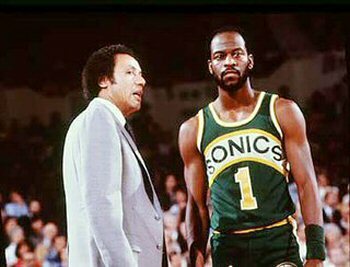 When Lenny Wilkens returned to Seattle as head coach midway through the 1977-78 season, he took over a team with a dismal record, but by season’s end he had coached the Sonics to the NBA finals. In his eight seasons with the Sonics the team won its only NBA Championship in 1979 and compiled a record of 357-277 for a winning percentage 56.3. After one season as the Sonics general manager, Wilkens signed on as head coach of the Cleveland Cavaliers. He engineered a miraculous turn around for the Cavaliers during his seven seasons in Cleveland. While considering his retirement Wilkens received an attractive five-year contract from the Atlanta Hawks; he coached that team to the Central Division Championship and was named NBA Coach of the Year in 1994. He remained at Atlanta until 2000. When the NBA celebrated its 50th anniversary in 1996, Wilkens was the only man to be named one of the fifty greatest players and one of the top ten coaches in league history. Lenny Wilkens was inducted into the Naismith Hall of Fame as a player on May 9, 1989 and as a coach on October 2, 1998. Lenny Wilkens coached Toronto in 2000-2003 and New York in 2004-2005. In November 2006 Wilkens was hired as Vice Chairman of the Seattle Super Sonics ownership group and later name President of Basketball Operations. Wilkens resigned from the Sonics organization on July 6, 2007 at the age of 69. During his years as a player and coach in the NBA, Wilkens has collected one Coach of the Year Award, an NBA championship ring, two Olympic gold medals, and been named one of the top players and top ten coaches in NBA history. Wilkens lives with his family in Medina, a Seattle, Washington suburb. Lenny Wilkens, The Lenny Wilkens Story (New York: Paul S. Erickson, Inc. 1974): Lenny Wilkens and Terry Pluto, Unguarded: My Forty Years Surviving in the NBA (New York: Simon and Schuster, 2000); http://www.nba.com/coachfile/lenny_wilkens/?nav=page.